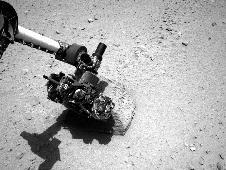 This entry was posted in News and tagged astronomy, curiosity, discovery, engineering, gale crater, mars, mars rover, nasa, pyramid, rock, science, solar system. Bookmark the permalink. Has this mission measured the ultrasonic background radiation from the position of Mars in it’s locations as we move around the sun? To my knowledge, I don’t think Curiosity has measured any background radiation. Are you referring to the cosmic background radiation of the Universe? Curiosity’s sole mission is to study Mars, including Mars’ surface radiation. Hope it will lead to a big discovery. “Sci-fi stories will start coming true” wow! It would be interesting to know if Curiosity Rover will find some evidence of life by the time it returns to Earth. That would be very, very interesting. I hope that will happen. I hope Curiosity will soar beyond expectations; it would be gratifying to know our imaginations have been grounded. Curiosity is a trait in us that has and may just open new frontiers in science. Then sci-fi stories will start coming true!